MPL AG, a key manufacturer of rugged embedded computers, announces QNX 7.0 support for the PIP30 Family. The embedded PIP30 Family offers CPUs up to i7 Quad Core and is designed such that the Fit & Form remains the same since 1996 when the first PIP was announced. The PIP30 Family comes with a large set of interfaces and leaves hardly any wishes open. The units come with four GigE ports, up to seven USB (3.0 and 2.0), up to four serial lines (RS232/485), PS/2, external SATA port, and as specialty an external PCI-E port. Internally available are two SATA 3.0 and two SATA 2.0. The system comes with 8GB ECC DDR3 memory and can be expanded up to 16GB. The unit can easily be expanded over various expansion ports like 6 x miniPCIe, PCI-104, PCI/104-Express, XMC, MXM, or external PCI-Express x 16. The input of the PIP Family is reverse polarity and load dump protected. The input power range starts from 9VDC up to 36VDC, optionally up to 48 or 110VDC. The solution is designed such that an internal UPS system with battery can be added. If a galvanic separation is required due to standards e.g. for marine or mining applications, then this can be added internally as well. The BIOS unleashes the power that the latest generation of hardware provides, while maintaining comprehensive compatibility to legacy software. MPL has access to the source code of the BIOS, allowing customization for special requirements from the customer, regardless if this is a splash screen, password protection, or other requirements for your project or application. The PIP30 is the solution that will meet your needs today and tomorrow. The solution is offered in the standard PIP housing as well as in a MIL housing or as Open Frame. Needless to say that the PIP30 solution has been tested with reports for most severe standards like EN60945, MIL-810 and EN50155, just to name a few. 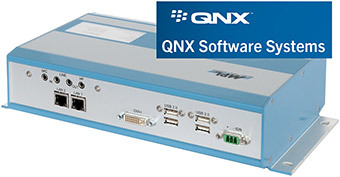 The QNX Software Development Platform (SDP 7.0) includes the next generation 64-bit QNX® Neutrino® RTOS and the award-winning QNX® Momentics® Tool Suite. It provides a comprehensive, multi-level, policy-driven security model incorporating best-in-class security technologies from BlackBerry, which help guard against system malfunctions, malware and cyber security breaches. Building on existing certifications including ISO 26262, IEC 61508 and IEC 62304, QNX SDP 7.0 also brings a proven safety pedigree.